Fluke 1760은 뛰어난 전력품질 분석과 일정한 기준테스트를 만족하기 위해 IEC61000-4-30 Class A 등급을 충족합니다. 이 장비는 유틸리티 시설, 산업용 배전시스템, 중저압 네트워크의 분석용으로 설계되었으며 유저가 원하는 기준전압, 알고리즘, 측정선택이 가능합니다. 1760 전력레코더는 사용자가 선택한 요소를 자세한 부분까지 캡쳐합니다. • 자유로운 기준전압, 스케일 설정: 세밀한 기준을 자유롭게 설정하여 특정 문제를 검출할 수 있습니다. • 무정전 전원공급(40분): 원인을 규명하기 위해 정전의 처음과 마지막을 기록하여 단 하나의 중요한 이벤트도 놓치지 않습니다. • 10MHz, 6000Vpk 파형 캡쳐: 매우 짧은 이벤트 조차도 자세한 파형을 얻을 수 있습니다. • 2GB 메모리: 장시간, 모든 전력요소를 동시에 저장합니다. • PQ Analyze 소프트웨어: 원인분석을 위한 트렌드 도표, 통계요약, 보고서, 실시간 모니터링 기능을 제공합니다. • Plug and Play: 연결시 자동으로 센서를 인식하며, 센서에 별도의 전원이 필요하지 않습니다. • 견고한 디자인: 절연케이스와 악조건 속에서도 신뢰할 만한 값을 제공할 수 있도록 견고하게 설계되었습니다. Dips, swells and interruptions are detected and stored in the event list. Also any trigger which fires generates an event added to this list. The Event list shows the exact time when the event occurred as well as the duration and magnitude. Sorting by several attributes of these events is possible to select one for further root cause analysis. RMS values, transients and fast transients can be stored if a trigger fires. Aggregation time is adjustable between 10 ms (1/2 cycle), 20ms (1 cycle), 200ms (10/12 cycles) or 3 sec (150/180 cycles). Calculating rms values, Harmonics and Interharmonics is performed synchronous to the power frequency. Variable refresh rate. This feature allows verification of instrument set up and delivers a quick overview of oscilloscope, transients and events. 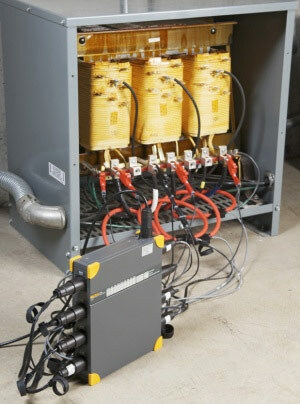 In case of a power supply failure an internal battery maintains the supply for up to 40 minutes. Afterwards, or in case of discharged accumulators the Fluke 1760 is turned off and continues the measurements with the latest settings as soon as the supply voltage returns. The battery can be replaced by the user. 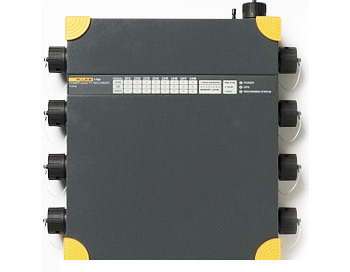 Fluke 1760 features LED indicators for the status of the 8 channels, phase sequence, power supply (mains or accumulator), memory usage, time synchronization, and data transfer. • Permanent light: normal power supply from mains. • OFF: supply via internal accumulator in case of a power failure. 10.24 kHz, The sampling rate is synchronized to mains frequency. 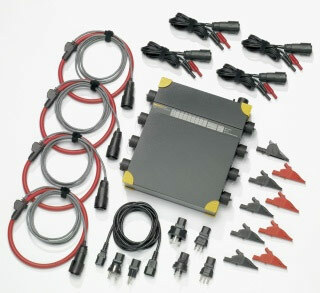 8 galvanically isolated inputs for voltage and current measurements. Each channel is equipped with a passive low-pass filter, an anti-aliasing filter and a 16-bit A/D converter. All channels are sampled synchronously with a common quartz-controlled clock pulse. The filters protect against voltage transients and limit the signal rise rate, reduce high frequency components and especially the noise voltage above half the sampling rate of the A/D converter by 80 dB, thus achieving very small measuring errors in an exceptionally large amplitude range. This is also valid under extreme operating conditions like transient voltages at the output of converters.